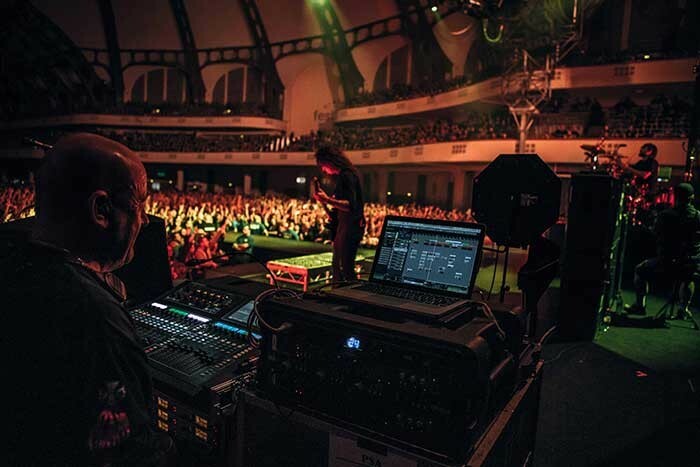 Europe – Californian band, Of Mice & Men, recently supported Linkin Park on the European leg of the Hunting Party arena tour, with Allen & Heath GLD-80 mixers performing both FoH and monitor duties. This was the first experience of using GLD for both FoH engineer, Dave Nutbrown, and monitor engineer Ian ‘Squid’ Walsh, who needed a system that could handle large arena shows whilst keeping to a compact footprint. A GLD-80 connected over Cat5 to AR2412 and AR84 AudioRacks provided 32 XLR inputs for stage sources and delivered five in-ear mixes, side fills and a pair of centre wedges. Both GLD-80s were fitted with Dante cards and mic preamp signals were split digitally via Dante over cat5 to FoH. The analogue gain was set at the start of the tour, with the engineers using the consoles’ digital trim (+/- 24dB) to independently make adjustments during the shows.